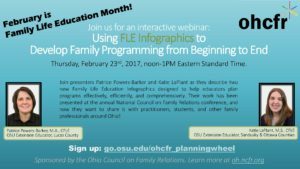 On February 23, 2017, Ohio State University Extension Educators, Katie LaPlant and Patrice Powers-Barker presented a webinar titled Using FLE Infographics to Develop Family Programming from Beginning to End. One reason to share this webinar in February was to celebrate Family Life Education Month #FamilyLifeEd. See below for links to PowerPoint, Infographics and recorded webinar. We welcome questions and discussion about Family Life Education. Please contact us through email. Patrice [email protected] or Katie [email protected] We would also like to thank our colleagues Carmen Irving and Jackie Kirby-Wilkins for all their work on this topic. Thanks also to OHCFR board members Rachel Archo and Courtney Walsh for help with this webinar.